Doubt you could wear this in St Andrews Och aye the noo Thats the kind of lame Scottish impression that people do when theyre NOT in one of our Scotland Morphsuits Luckily you wont succumb to such low comedic behaviour nope, youll be more Scottish than Sean Connery impersonating Bravehearts Scotch-drinking Scottie dog. Features double stitching all the way around the inside of the suit to ensure durability, and two zips make de-morphing quick and easy. Plus the Spandex means a better fit be warned that fakes are baggy and saggy. 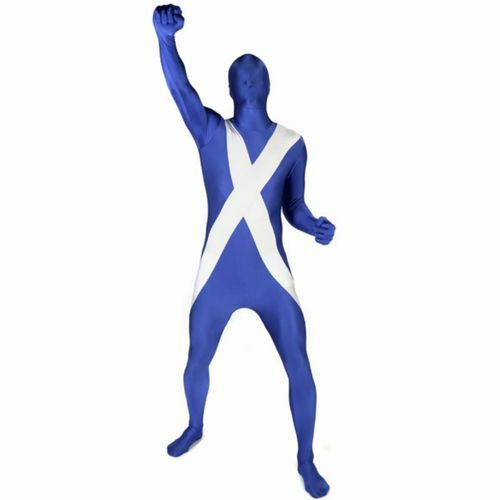 A great outfit for Halloween, stag do, World Cup match or just popping round to Ewan McGregors house for a set of bagpipes and a, er, McFlurry.